Also known as An Ghuala Ghorm [TH], 'the blue shoulder'. As with other mountain names beginning with coom-, this name has been transferred from a nearby corrie to the summit itself. It is not hard to guess which is the corrie in question as the presence of nearby Lough Coomcallee gives it away. 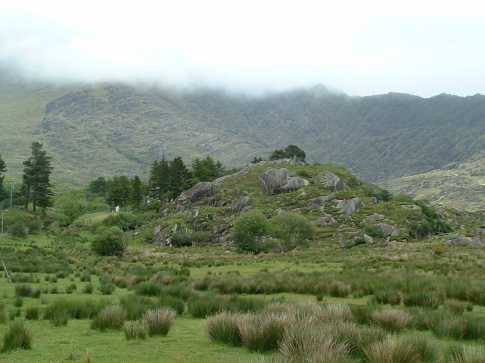 Another Coomcallee is a townland on the north side of Macgillycuddy’s Reeks, though it is now better known by the English translation: The Hag’s Glen. Coomcallee is the 204th highest place in Ireland. Commcallee can be very easily ascended from the Glenmore valley to the south west. A tortuous but scenic drive from Waterville ends in a spacious valley. Beyond the last farm (please respect), a broad track can be seen climbing the hillside at an easy gradient. This eventually stops at V610681 A, just 50 metres short of the ridge fence. The fence passes over point 642, descends 30 metres (the map lacks some contours here) and rises again to the summit, where there are peat hags. Thus the summit can be attained safely in mist. When descending, however, remember that you will not encounter the broad track if you simply walk beside the ridge fence. Furthermore, the track does not start from the lowest point between Coomcallee and L Iskanamacteery Mtn, but from a point 300 metres to the east.